Just when I thought I had mastered the skill of ordering gluten-free, I was reminded once again, just how CAREFUL a Celiac must really be when eating out at a restaurant. So the story goes...headed to a great restaurant in Truckee, California over the weekend called Moody's Bistro & Lounge. It has a great atmosphere, with Jazz bands playing on the weekends and a really cool and sultry bar, along with fun patio seating and a diverse and delicious menu. I've eaten there several times in the past few years and have always done so safely. After perusing the menu, I decided upon the Risotto entree - I just love Risotto - Who doesn't?! This dish offered a plethora of garlic and buttery goodness, according to the menu description and the waitress or server's recommendation. I was sold! Now, whenever I have eaten Risotto in a restaurant (or in Italy) it's always been made of Arborio or Basmati Italian white rice, which is exactly what I expected would appear before my eyes and into my tum-tum. I was excited...but when our very well-educated server reappeared at our table she alerted me to the fact that when she put my order in to the chef, she double-checked that everything was gluten-free - and learned that their Risotto being served that night was actually Farro whole wheat pasta NOT rice, as it normally is. Wow! "Farro is a whole-grain relative of wheat and spelt with a flavor reminiscent of hazelnuts and barley. 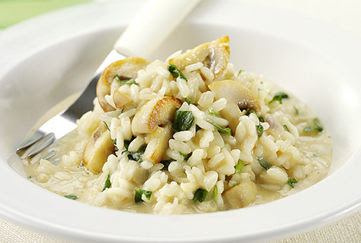 When cooked, each grain retains a firm, chewy texture, which makes this risotto practically impossible to overcook. 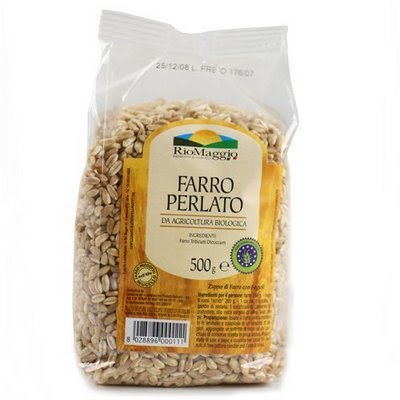 You can find Farro in most Italian grocery stores and in the bulk section of many health food stores, but if you are coming up empty-handed, spelt will make a decent substitute." "Risotto is a classic Italian side dish that uses short grain rice (one variety is basmati) that releases lots of starch during cooking so the finished dish is very creamy and rich." Our server and I conversed for a few minutes about this situation and she explained how and why she is informed and educated about gluten free eating, as are their chefs. I told her that she was literally, my life-saver that night...no joking around about that fact. I would have dug into that bowl of delicious Italian goodness never knowing that I soon I would be facing a night of misery and WEEKS of suffering from being so poisoned. After our dramatic realization and reordering a delicious Kobe 8 oz. steak, I sat quietly in my chair for a few moments feeling so thankful (and stupid) that this woman was educated enough and cared enough to have gone the extra step to ensure that she knew and I knew exactly what I was eating AND and that I would be safe. It was also a stark realization that I need to re-arm myself with more information and rededicate myself to asking the vital questions each and every time I order my food, whether I'm certain of the ingredients or not. So to all of you out there...take this advice from someone who's been ordering gluten-free for eight years...Always, always double or triple-check that what you are about to eat is 100% safe and gluten free. The next time I visit Moody's, I'm going to seek out my "life-saver" waitress/server and thank her again for taking the time to be educated and for watching out for my safety. Here's a delicious and totally gluten free Risotto recipe that you're sure to love, created by my favorite Gluten Free Girl. I have a confession to make…but before I blurt it out there for all the world to read (or maybe just my devoted readers)...I need to premise the confession with the fact that I’m a positive person, to my core, most of the time, overall…and hopefully a positive Bloggerette, as well! OK – now I feel better. So here goes my confession - I feel like garbage today…or perhaps it’s even been for a few weeks now, with no certain reason or tangible explanation other than perhaps, it's simply the woes of a Celiac. Though we can feel a million times better when we live gluten free, I still believe that Celiacs are more susceptible to issues that others don’t face and my “100%” is not the same as a healthier person’s…I’ve been compromised. That’s just a fact to live with. Today, in particular, I haven’t felt well at all. So I’m left here to ponder everything I’ve eaten…which wasn’t much. The only possible culprit could be some of the bacon bits or pieces on my delicious salad that I was finally able to eat at 2:30 p.m. this afternoon. But here’s the thing that you can all understand…I’ve eaten at this lovely café Voila, many times and have ordered this salad at least six times before, and never with any issue. Today I was even extra careful to make sure they replaced the Blue cheese with Feta, just to be on the double-safe side…but now here I sit, sipping a small glass of Cabernet sauvignon (because I swear red wine does help when you get poisoned or have an upset stomach…NOT that I’m saying make a habit of it…wink) pondering WHY it’s so tough to be a Celiac sometimes, while other days it is an amazing blessing. Do I see any heads nodding in agreement out there? Here’s the other thing – if it’s not that I had a gluten mis-hap, then there’s a strong possibility that it could be my other fantastic auto-inflammatory disease rearing its ugly head once again, Endometriosis. I figure that so many of you have written to me sharing your very personal health stories and issues, which I greatly appreciate, that it’s a safe forum to divulge ALL of my issues that are completely connected back to having Celiac Disease. So here’s my really important question for any and all women reading this post - Have you ever suffered through or lived with the combination of Celiac and Endometriosis? There’s always “safety in numbers,” as well as, support, so I would love to hear from anyone who’s living with the two. Greater insight is always appreciated. At this moment I’m toying with the thought of delving further into all that is involved with the pain, bloating, exhaustion and mystery of Endometriosis but I would prefer to wait and see if I hear form any of you out there …and later perhaps, I’ll compile a more detailed post that could include other’s perspectives and experiences of what it’s like to live with both diseases, while remaining sane and with a quality of life that every woman deserves. The last comment I will make about this, however, is that there IS a connection between these two diseases. I have always known this…for years I would try to express my ideas and feelings about this to my doctors, only to be dismissed like I didn’t know what the heck I was talking about. That is until I found my dream Celiac doctor and Gynecological surgeon – both in Reno, Nevada. Who would have ever guessed? All the years of traipsing around California in search of certainly “the best” doctor we could find, and all the while, both of my angels were in The Biggest Little City. In case any of you live in this area, here is their contact information: Dr. Yamamoto of Digestive Health Associates and Dr. Crawford of Women’s Wellness Center. Let’s just say…they both get it! So now that I feel better after spilling my “downer-feelings” out to all of you…though you are most likely feeling a sense of blahhhh, especially after my last peppy-Parisian-post with yummy photos of croissants we can’t eat! Ha Ha. But hey, sometimes a girl just has to let down and let it out. I know that you will all understand. It’s a never-ending quest, this life as a Celiac, isn’t it? In my opinion, it all goes back to encircling yourself with a wonderful support group of folks who truly care about you and have your back, just as you would, theirs. Listen, there are MANY, MANY worse health issues or diseases I could be laden with in this life; I always remind myself of that fact. However, it doesn’t take away from our little cross, either. But at the end of each day, even this one, I am reminded of the Celiac Circle we share and are all apart of, and that brings me great comfort (tonight and always) and many blessings. I will share a new website that a previous boss of mine forwarded to me this week – it’s called Gluten Free Drugs and is a source of information for GF drugs, both over the counter and prescription. The multiple lists of categorized information are in PDF format and it appears to be quite a little wealth of very important information. Please take a look and bookmark this baby! There it is – my one positive suggestion and paragraph in this entry! See…ultimately I am a “glass half-full” gal…just not every night! 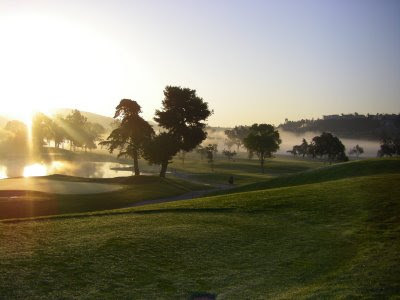 And, if you are wondering about the lovely photo at the top of this post, it was taken at 7 a.m. from the first tee of La Costa Golf Club in San Diego – that photo fills me with hope and a sense of renewal each time I see it – like the fresh start to a new day. Croissant? ...ah, Oui...better yet, o No! I'm a huge tennis fan and French Open groupie! I mean what can be better than hanging out in the City of Light and watching Rodger Federer dash around on the red clay?! So for the past couple of weeks I've been reading all about and watching as much of the tennis coverage from Paris as possible, and thinking back to the good old days when visiting Paris meant getting to partake in all the fabulous goodies from every Patisserie you passed and wolfing down croissants...ahhh I can still remember so vividly, ever bite of the last croissant I ate. It was September of 2000 and though I had already been diagnosed with Celiac Disease four months earlier, it was my last "hurrah," so to speak, with my favorite French pastry. I remember the buttery, flakiness of each bite as my teeth sunk into the delicious and soft middle of the half-mooned-shaped delicacy. There are days, like today, when that memory conjures up not only the taste of heaven, but of all things Parisian...the city sounds, the Seine, sitting along the Ile de Cite...beauty and abundance, abound. My point today, however, is intended to be more of a serious one...because I was very foolish looking back now, to have purposely eaten straight wheat/gluten months after my diagnosis...but this process of changing over an entire lifetime of eating habits and preferences takes time - a lot of time and a lot of convincing ourselves that we CAN do this. No one should ever kid you - it's tough! I met a woman last week who is in her late 60's and was just diagnosed with Celiac a few months ago, along with her brother who is also in her age range. She was telling me how difficult this "new life" is and how she still regularly eats gluten, knowing it's just so impossible to completely rid from her diet and lifestyle...mind you she is also Basque and it's a hugely cultural thing to eat bread. A true Basco doesn't feel Basque when having to order a chorizo without the bread - let me tell you - it can mess with your psyche if you don't take the right approach and garner the right attitude. Okay, but back to the lovely woman I was speaking of. So we had this long chat about how she can't break free of still consuming bread or donuts, etc. I kindly and carefully tried to express to her that this behavior can be very damaging and most of all, dangerous to her health and continued quality of life. She nodded her head in agreement and then said, "well, I give it my best try each day but I won't ever completely give up all wheat - I just can't do it." Though I definitely understand and empathise, I do NOT agree with this way of thinking. I have an Aunt who most likely also has Celiac, but refuses to get tested. She would rather live in misery than face the facts, get tested, and make the correct adjustments to give her some quality of life - I mean really at the end of the day, it's only a piece of bread or a store-bought cookie that we've gone without. Life is so much more than simply food and in this day and age, we as Celiacs have quite an abundance of choices out there to enjoy, and can find almost everything a wheat-eater can consume. There are a plethora of websites now, blogs, on-line shopping and new GF products arriving in stores weekly - (check out my list of sites on the right side of this blog). It is my firm belief that every diagnosed Celiac needs the utmost support from their circle of family and friends and advocates on their side, so if you know a Celiac or you yourself are one, make an extra effort to reach out and teach these folks how to LIVE without the dreaded gluten that can ultimately wreak such havoc upon our health and our lives. 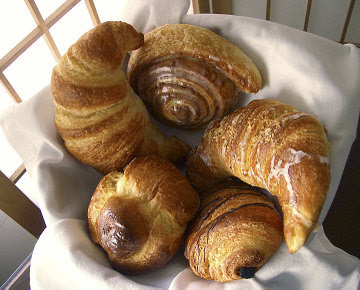 So as much as I cherish Paris and Europe, when I'm visiting I no longer partake in anything that could make me sick...and with the Euro as strong as it is, I'm certainly not going to throw my good money away to be sick in a hotel room because I HAD to have a croissant! We are blessed to be able to eat so many fantastic foods and are even the more healthier because of that fact. 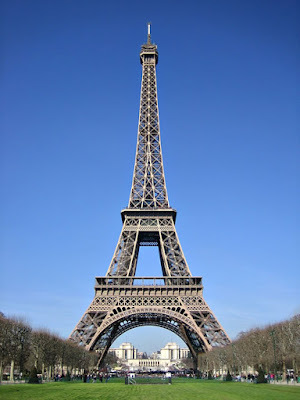 I would still take a night out on the town, in the City of Light with Rodger Federer, but I would have to say, "no merci" when offered that croissant! Live with Abundance ~ Bon au revoir.